Now that Halloween is over, the next holiday on everyone’s radar screen is Thanksgiving. Thanksgiving is one of the most widely celebrated holidays in America. For some, it is a day of watching football; for others, a day of eating turkey. For most, it is a day of getting together with family. When families get together and there are lots of different personalities stuffed into a small space, the results can sometimes be explosive. When you have grandparents or other senior family members at your Thanksgiving dinner, this can either serve to mitigate explosions or to exacerbate them. In some cases, having older family members at the event can ensure that everyone is on their best behavior. In other cases, the stress of inviting an older relative can have a negative effect on the host and other guests. Should You Invite Grandparents to Thanksgiving Dinner? Of course you should, even if it means some added stress. 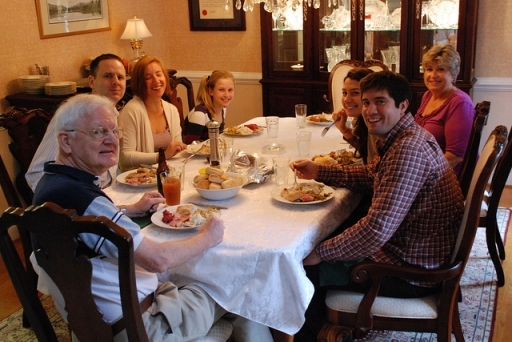 There is no truer spirit of Thanksgiving than inviting the older folks who brought you into this world and raised you. That being said, if you are hosting the Thanksgiving meal, you don’t need to be a martyr and let all the stress fall on your head. Here are some scenarios in which hosting grandparents and older relatives can be stressful, and how you can plan ahead to avoid that stress. How will your older relatives get to your house? If your parents/grandparents don’t drive, they may expect to be picked up in order to get to your house. If you are the person preparing the entire meal and hosting, delegate this task to someone else. A spouse, a child who drives, or another relative who is coming by car. What if your older relatives have dietary restrictions? Maintaining a healthy diet is important for seniors, but if the senior coming to your Thanksgiving meal has extreme dietary restrictions, you can buy or prepare one simple dish that they can eat – you don’t need to prepare a whole alternate meal. Remember, your older relatives are mainly coming to spend time with the family, not to eat. What if your older relative has dementia or Alzheimer’s and people are uncomfortable? Not your problem. You can certainly tell your guests in advance that this person will be there, but you hsould not fail to invite a senior because his or her medical conditions makes people slightly uncomfortable. Children and relatives can learn kindness when they see parents treating their own elderly parents with respect and kindness, and what better message is there on Thanksgiving? In this situation, though, it’s a good idea to have your elderly relative’s Alzheimer’s caregiver come along, especially if he or she needs help eating and using the bathroom. What if your elderly relatives yell and scream? Unfortunately, one of the characteristics of Alzheimer’s is aggression and anger. It’s not who the person is, it’s just a symptom of the disease. Still, this can be extremely unpleasant and even traumatic for some people, especially children. If this describes your elderly relatives, you do not need to invite them to your meal. If possible, however, you can make a pre-Thanksgiving dinner for just you and your elderly relative a day before Thanksgiving. This way you are showing the person your love while protecting your children from potentially scarring situations.